Hey everyone! I hope you all are doing well! 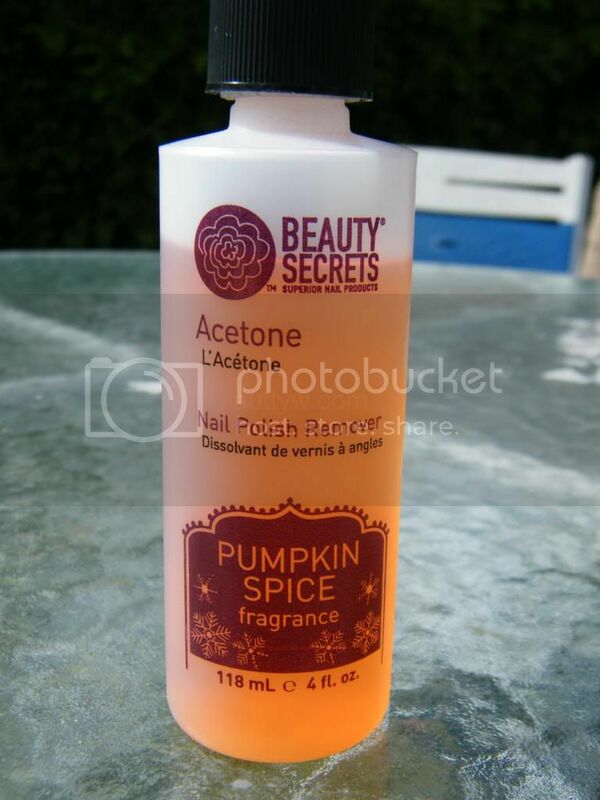 :D Today's review is all about the Beauty Secrets Pumpkin Spice Scented Polish Remover... That's a complete mouthful isn't it?! I saw Nouveau Cheap post about this on Instagram back in October I believe, and let me tell you I was at Sally's the next time I needed more polish remover! This IS a limited edition product, so if you're wanting to try it I would suggest going to get it now because there is no tell when they are planning to get rid of it. Scented polish remover sounds pretty unappealing though right? I'm assuming the idea of this is loosely based off of scented nail polish, which has grabbed some ground and really taken off. A bottle of this remover is $2.49 for 4 ounces, which if you really think about it, is not a lot. Especially or someone who changes their nail polish color quite often, or does swatches. Scent wise, don't pull a me and attempt to smell it straight out of the bottle. You don't get any kind of scent except for acetone, which is not pleasant by any means. Now, I don't get any pumpkin spice smell from this at all. You don't get any scent until it starts to dry, and it smells like cinnamon. If you're super sensitive to scents, definitely stay away this could bother you. to me though it's not over powering, but everyone is different. I really like the cinnamon scent of this, but I am kind of bummed that it doesn't actually smell like pumpkin spice, I think that would be really interesting. it sounds interesting! Never knew that Sally's had scented polish remover! I guess that I've never really looked! All I have here is a polish remover from Walgreens and some small Zoya remover bottles!